During the 18th century, Villa Bertramka was the country home of the Dušek family. Today it lies in the fast-growing Prague neighbourhood of Smichov. Its fame rests on the fact that the Duseks were friends of the great composer, Wolfgang Amadeus Mozart. The Villa Bertramka is the most significant place in Prague connected with one of the world’s greatest composers – Wolfgang Amadeus Mozart who stayed at this 17th-century Villa during his visits to Prague in 1787 and 1791. A former vineyard manor house from the turn of the 17th century became in 1784 the property of the singer Josefina Duskova and the pianist, pedagogue and composer Frantisek Xaver Dusek. They, most probably, deserve credit for staging of Mozart’s operas Die Entfuehrung aus dem Serail and The Marriage of Figaro in Prague and for inviting the composer to Prague. Here in the idyllic environment of Bertramka Mozart finished the score of Don Giovanni shortly before its memorable first night on October 29, 1787. At Bertramka Mozart also composed the concert aria Bella mia fiamma, addio and dedicated it to Mrs. Duskova. Mozart called his stays at Bertramka the most beautiful moments of his short and eventful life. 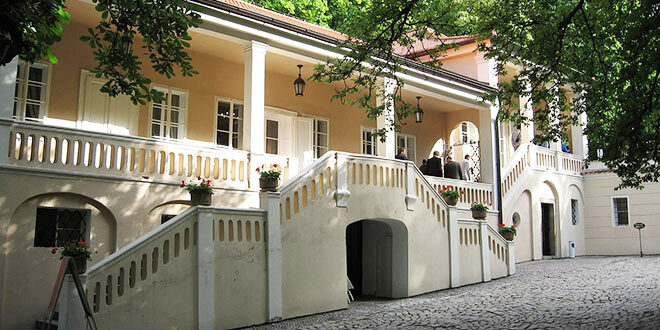 In 1956 the Museum of Mozart and the Duseks was opened on the Bertramka premises, bearing witness to the history of the place and Mozart’s visits. All available memorabilias of W. A. Mozart and the Duseks, namely personal keepsakes, musical instruments, manuscripts, letters, period pictures, engravings, prints and other documents testifying to Mozart’s close relationship to Prague and to distinguish personalities of the then affluent Czech culture, have been gathered in this exhibition. The exhibition occupies what was then a residential floor with seven rooms of which the salon, where Mozart allegedly used to stay and the bedroom, where the original painted wooden ceiling has been successfully restored, are the most impressive. The music salon with period decoration that would be used for music purposes at the time of Mozart’s visits, now hosts regular chamber music concerts sought by all music-lovers visiting Prague because of the constant high standard of artistic quality. In the summer months concerts are held in the Bertramka garden (from April to October), as its amphitheatre-like terrain not only provides ideal acoustic conditions for music productions, but also transforms the whole place into an enclosed oasis of peace, tranquillity and memories! Address: Mozartova 169, Smichov (take a tram #4, #7, #9 or #10), museum tickets cost 110 CZK, if there is a concert, tickets cost 390 CZK. Concerts starts usually at 5pm.